I was awake early, so got up just in case the dawn was nice: and it was! Thankfully the rain over night was not too much, so the tent was packed up dry. Weather: Day started with overcast skies. 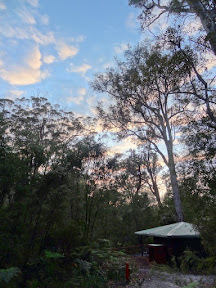 Sky started breaking up after morning tea and by camp had scattered clouds with lots of sun. 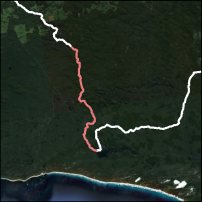 Initially the Track winds along Laws Track through swampy areas and small stands of mature Karri (often on raised areas). We were treated with a large array of flowers on the sandy soils of the swampy areas, Sandi particularly enjoying playing with the trigger plants. The river was never far away, but hidden behind its vegetated banks. A very enjoyable walk today. Huge variety of forest and swamp: just fabulous. A huge variety of flowers and orchids as a result of it we just moseyed along, looking and chatting. Got to river bridge for morning tea. Sky quite dark, but thereafter it showed some blue and before long there were shadows and the sun was out! Had some rain overnight, but dry and overcast this morning. So thankful it didn't rain. At one point, we must have been walking so quietly on the sand, we surprised a kangaroo on the Track as we came over a hill and found him sitting in the middle of the Track in front of us. Neither of us could believe our eyes, and there was a momentary delay before he turned on his heels and hopped away. The swampy areas were proving to be a revelation: not a nasty place to wade through, but an awesome space - so different to what we're used to. It was a relaxed walk this morning, just ambled along and enjoyed all the flowers and scenery -- the large swamp lands are amazing. We stopped for morning tea on the Chesapeake Road bridge, where they kindly supplied some log benches for that purpose :) After crossing the mighty Gardner River for the last time we stay on the Eastern side as we head south through more swampy areas that the Guidebook warned could be inundated. Had a pack-off rest by the river, then a very pleasant run into camp arriving by lunchtime. ... but on last bit, so close to hut, decided to try out our sandals. They proved to be pretty good. The river sandalsworked very will for our test drive today. We put them on for the last 1.5km. Extremely snug on the foot, both in and out of the water. A little bit of leaf / twig into the sandal on exit of pool, but washed out at next stream. They aren't waterproof though, and I'm still trying to dry them in the sun, so I can put them on with my socks. Arrived at Marringup in pretty good time, but a little late for Sandi's lunch. The shelter seemed full of people so we retreated to the lake where we ate and washed and then set up our tent. We'd agreed to have lunch by the lake, but there wasn't really much of a beach unfortunately. Still: we did it. I then had a good rinse and did my knickers and shirt. P still happy with his. Spent the afternoon discussing other walks with some of co-walkers, especially the Hume & Hovell, which we were pretty interested in doing at some stage. Towards sunset we wandered back down to the lake edge to witness a wonderfully gentle sunset over the lake, which promised a lovely sunrise tomorrow morning. Couple of blokes arrived from the other direction, so good updates on water up track: Long Point water tank dodgy and fair bit of water on track. Also asked David about Hume & Hovel track (he's from Canberra) and very experienced. Had picked 2 samples of bush as water bush and tried again. Fluffy one lathered. Saw 1 snake today: small (thin) grey and disappearing. All the voices here say it was a Dugite. Great to talk about the Hume and Hovel and Alpine Tracks with David. It will be very interesting to start sussing it out when we get back. David mentioned a boring section along the Hume Highway -- maybe a bike would work? Very pretty campsite and lake is gorgeous: didn't swim. Maringup campsite is a jewel, but it doesn't address the lake very well, with only a single path down to the edge, and nothing around. Harry says it's very full -- maybe sitting areas have been covered? Encouraging to get an update on the track coming up from David and Tim: We should be OK to morning tea, then we'll change into sandalsfor the last bit. It's definitely easier walking through the water than picking your way around. (they're weren't keen on anything too spicy). And so off to bed with high hopes of some 'great' dawn photos across the lake tomorrow morning! The lake was also pretty in the sunset. We went down later for the moon rise, but the path down was not at the most advantageous position -- so no nice reflections. The frogs didn't mind, and many different species sung their hearts out. Hope to get up early for the sunrise, so set the alarm. The following times really do show that the morning was as described: 'relaxed' and we 'moseyed along' -- amazing!